This post has been long over due and I cannot express how much I’ve been pushing myself to write this post. Settling down in a new home and office at the same time can be very exhausting. I’m slowly getting my life back to normal and enjoying meeting new people and learning something new every day. I happen to know about Martha’s preserves through a friend of mine and was curious to meet the face behind such lovely products. Every product which comes out is dear to every entrepreneur and setting up a business coming from foreign land is not an easy task. Meet Martha Kohlhagen. She makes awesome marmalade and sauces which gives you a taste of a true artisan product sans preservatives. 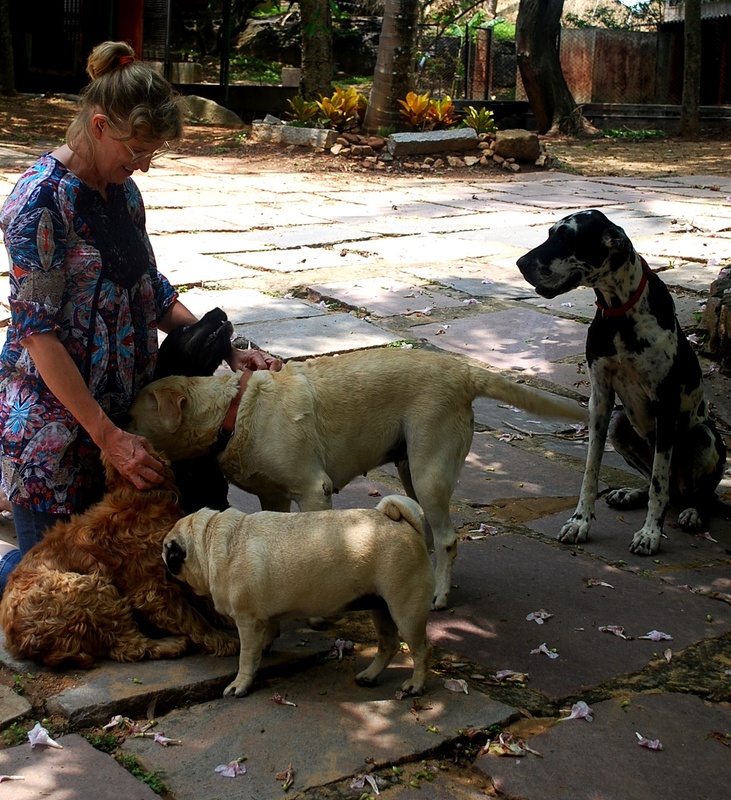 Martha’s Preserves operates from a 20 acre farm at Bannerghatta. Martha stays and works from her farm. They are a team of 10 dedicated individuals dishing out 10 plus yummy products like pomegranate and orange marmalade, lemon curd, caramel sauce, chocolate fudge, onion relish etc. Martha has a background in food technology and uses her grandmother’s recipe to make these delicious products. She does keep the Indian taste in mind and has created products like chilli pineapple jam. 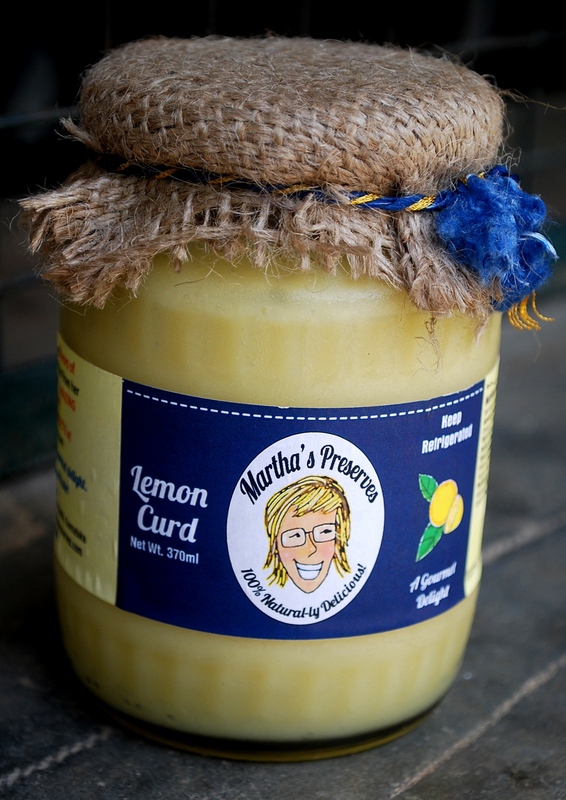 Martha aims to produce quality products without comprising on taste. She says that it takes a lot of care and planning to sort fruits and make seasonal products. Martha plans to increase her reach to other cities too. What really impressed me about Martha’s preserves is that they not only make unique combinations but also have sauces like caramel sauce, chocolate fudge sauce on offer that make life simple. Some ice-cream and a combo of these two sauces makes for a stellar dessert. However, for those who like a little more salt in their caramel sauce can add some sprinkles of sea salt to round up on the flavours. Martha’s Preserves are a Gourmet range, hence be prepared to shell an extra buck for these artisan products but trust me when I say they are worth it! Since the time I’ve moved back to Bangalore, I’ve been enjoying avocados. My mom’s neighbouring garden produces some of the best and creamiest avocados that I’ve ever had. Long live thy neighbour! 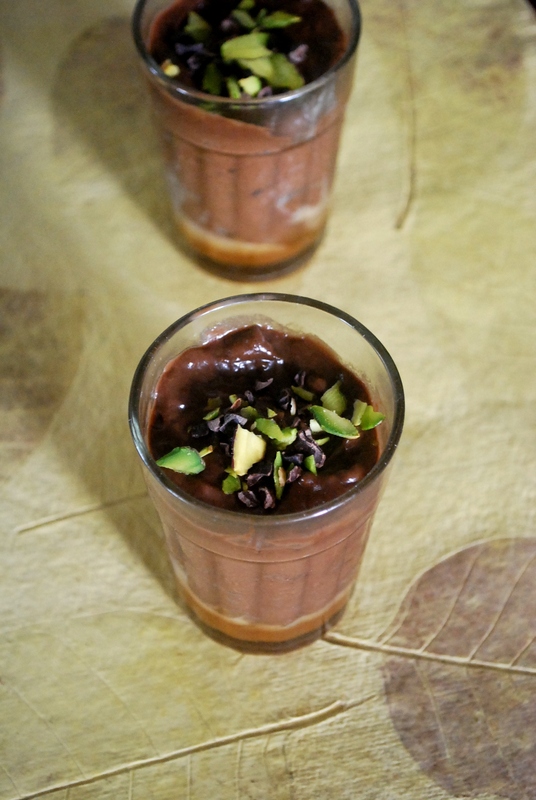 Avocado mousse is so easy to make and can be made guilt-free. The natural creamy texture of the avocado makes all the difference and you won’t miss any cream in your dessert. If you don’t have Martha’s chocolate fudge at home, you could use cocoa powder or dark couverture chocolate (melted). You can also spike your dessert with a teaspoon of brandy! This dessert allows you to play with ingredients and feel free to experiment by adding rolled oats, cashew butter or hazelnut with different flavours or textures. Add all the ingredients in a mixer except garnish and make a fine paste. 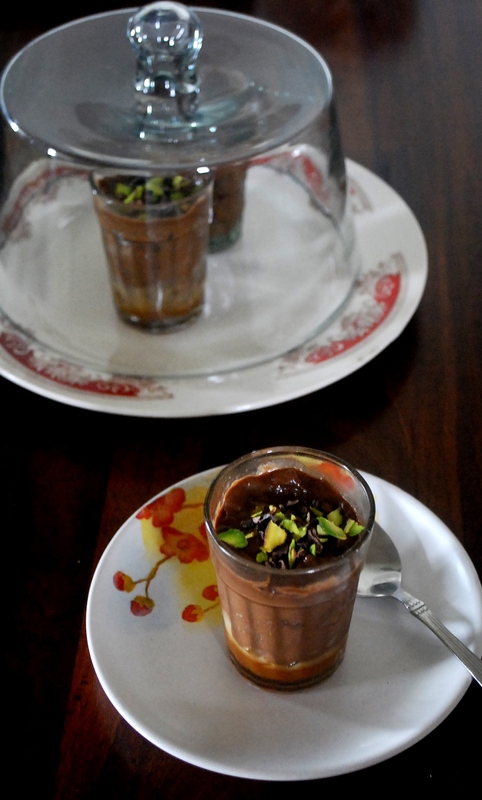 Pour the mousse into the desired serving glasses or bowls. Garnish with some nuts and cocao nibs. Refrigerate for minimum of two hours before serving. Note: I layered my serving glasses with some caramel sauce at the bottom to give my dessert a surprise element. Martha’s Preserves is available at Foodhall. Caramel is generally made by adding butter and cream to caramelized sugar. 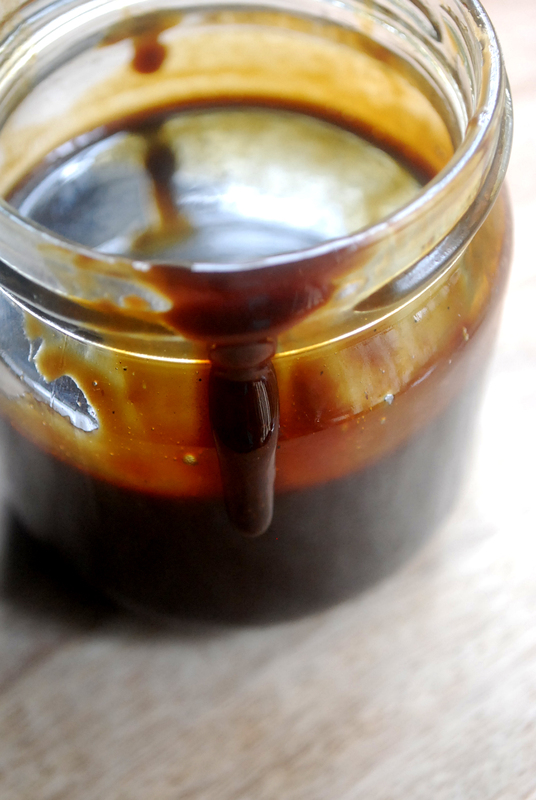 I’m sharing a vegan recipe of caramel sauce here. You heard it right! It tastes equally good or I can say even better. 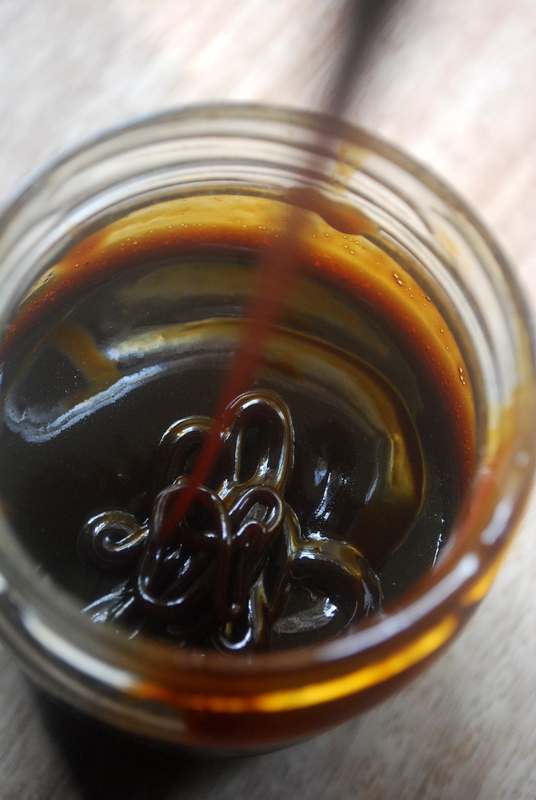 The secret ingredients in this caramel sauce are coconut sugar and coconut milk. Coconut sugar is better than refined sugar and the coconut milk gives right amount of fat for a great texture. The low glycemic index (GI) of coconut sugar is 35 (around half of white sugar) and has led some to claim that it’s a good sugar substitute for people with diabetes. It has a high mineral content compared to other sugars and is a rich source of potassium, magnesium, zinc and iron. You can use coconut sugar 1:1 in any way you would use regular sugar, including coffee, baking or cooking. More benefits and details in my previous post about this wonder sugar. How does coconut sugar taste? It does not look, smell, or taste the way one would expect it to (like coconut). It actually looks, smells, and tastes like brown sugar with the slightest hint of caramel. Although this recipe is fairly simple, it does require some understanding of the caramelization process. When sugar is heated to the point of melting (with or without water), it begins to color and caramelize. If left as is, it will solidify into a hard mass. If water is added, it becomes a thin sauce. If water and fat are added, the caramel develops body and texture. Adding water will make the caramel bubble up- Caramel is extremely hot and can do serious damage, so be careful. Mix all the ingredients in a pan. Place it on a stove top, on low flame. Allow it to simmer for 30 minutes, until thick or till desired consistency. Stir occasionally and keep a keen watch on the sauce. Once done, allow it to cool before transferring into a bottle. Remember, that the sauce will thicken after cooling. You can refrigerate up to 3 weeks.